Squeaky Books: AHH!!! We did it! AND How not to raise a reader. NOTE TO CONTEST WINNERS: I'm having some trouble with getting your books to you from the UK. Please be patient. I'll let you know when they ship. WOAH! We just jumped right over the 200 followers mark and into 202!! Hurrah!! I'm so pleased. I shall immediately begin gathering up books to give away. Hurrah! 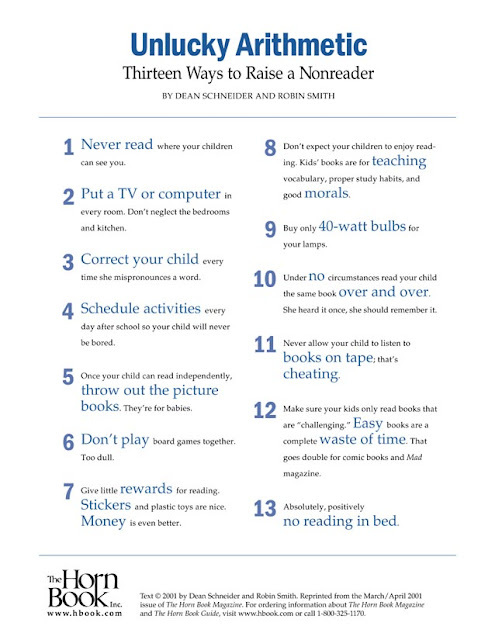 In the meantime, read this poster that Heather Z. posted on her blog. So true, so sad. This is truly awesome! Mind if I repost? That is so true. And sad. Is it bad that I smirked a little when I read those? My parents raised readers, but they definitely committed a few of the 'sins' listed. Not all of them will ruin reading for every child. But the cumulative effect of more than a few of them would, probably. Congratulation on the 202 followers!!! That is an achievement! I just need t get my mumsy dear to see the light about the last one... I thought it was normal to stay up till 1 am reading!! !